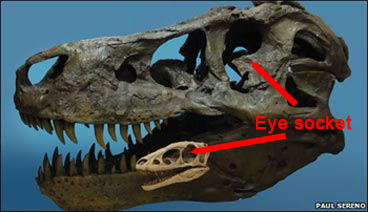 Why Did Dinosaurs Have Small Eyes? Home/Dinosaur and Prehistoric Animal News Stories, Dinosaur Fans, Main Page/Why Did Dinosaurs Have Small Eyes? Telephone calls and emails into the “dino den” otherwise known as the office at Everything Dinosaur last night, when the popular Radio 2 early evening show, Simon Mayo Drivetime, provided a prehistoric themed poser as part of a regular slot helping out with listener’s homework. One of the two questions sent in involved the Dinosauria, why did dinosaurs have such small eyes? Does Everything Dinosaur Have A View on Question B? Any views on question two? In short, dinosaurs did not have small eyes, in fact, the eyes of some dinosaurs were quite large in proportion to the rest of their body and the word “proportion” is the key here, but more about that later. You see, (no pun intended), it all depends on the type of dinosaur you look at. Not all dinosaurs were the bus-sized, meat-eaters so popular with little boys and girls, as shown in the picture above. That fearsome dinosaur looks like Carcharodontosaurus saharicus (Car-car-oh-dont-toe-sore-us, sa-har-ri-kus) as depicted in the BBC television series “Planet Dinosaur” which was first aired in the autumn of 2011. The grey, long-necked dinosaurs in the background would have dwarfed even the largest carnivore. 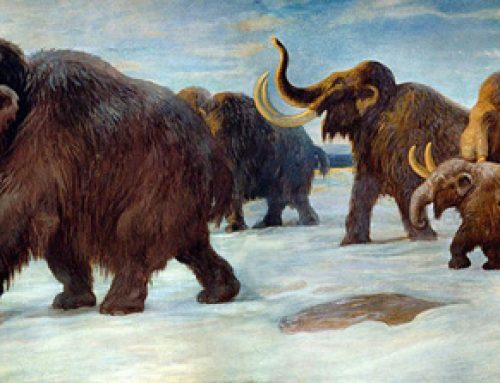 They look like Paralititan stromeri, colossal animals that could have reached lengths in excess of thirty metres or more and perhaps weighed seventy tonnes. Take a look at a skull of a much smaller dinosaur, a member of the Velociraptor family for example, and you will see that the orbit (the eye socket) is relatively large when the dimensions of the rest of the skull are taken into consideration. Dinosaurs such as Velociraptor are very closely related to modern birds. Birds have very large eyes in proportion to their body size. After all, if you are going to fly, having large eyes coupled with excellent eyesight makes a lot of sense. Members of the bird Order (Aves), have the biggest eyes relative to their body mass amongst the vertebrates, some species have eyes so large that eye movement is limited within the orbit of the skull, when some birds want to have a good look around they have to turn their heads, the eyes cannot move independently in their sockets. Turning your head to look, (a large beak doesn’t help). What about those Really Big Dinosaurs? This is all very well, some dinosaurs had proportionately big eyes, but what about those really big dinosaurs, animals like Carcharodontosaurus and the monstrous Paralititan mentioned earlier? It’s that word again “proportion”. In proportion to their bodies, large dinosaurs did have relatively small eyes, this phenomenon is observed in large mammals today, elephants, rhinos and the largest animals of all the Cetaceans (whales and dolphins). Really big animals tend to have eyes that look small. The actual diameter of the eye might be much bigger than our own, but since the skull is so big compared to ours, then the eye seems much smaller in comparison. Newly hatched dinosaurs had big eyes in proportion to their body size. As the animal grew so its body proportions changed and gradually the eye became much smaller when compared to the rest of the body. As dinosaurs grew, their eyes become proportionately smaller. It’s worth remembering that despite a common public misunderstanding, dinosaurs were perfectly adapted to their environments and way of life. As a clade, the Dinosauria has been around for some 800 times longer than our own species. From what we know of the closest living relatives of the dinosaurs, the birds, these reptiles probably had excellent colour vision and in many cases their visual acuity, ability to see movement and their colour vision spectrum were much better than ours. Think of it this way, studies of the internal structure of the skull of Tyrannosaurus rex indicate that this ferocious predator had a optic nerve about as thick as an adult man’s thumb. That’s a lot of data going into that part of the brain dedicated to processing information from the eyes (occipital centre). The orbits (eye sockets), in the skull of “Sue”, the largest mounted T. rex skeleton, measure nearly 10.5 cm across, this suggests that this dinosaur had eyeballs around 8 cm in size, that’s bigger than a tennis ball. These eyes were held aloft some four metres in the air, an excellent viewing platform. In addition, the position of the eyes in the skull gave this Theropod a degree of binocular (stereoscopic vision), probably greater depth perception than ours. Ideal if you are an ambush predator. A three-dimensional reconstruction of a T. rex skull. Research into the eyesight of Tyrannosaurus rex, published in 2006 by the University of Oregon concluded that big, Late Cretaceous meat-eaters like the “King of the Tyrant Lizards” may have had eyesight that was at least ten times* better than our own. Vision may not have been the primary sense of T. rex, but those proportionately small eyes could have very probably spotted you before you had seen it and that’s quite a sobering thought. Stevens, K.A. 2006 Binocular vision in Theropod dinosaurs. Journal of Vertebrate Paleontology 26(2):321-330. *visual acuity up to thirteen times was stated in the paper.